Anyone who is keen to see the house-museums of famous Russian writers but isn't in Moscow can now do so thanks to Google’s latest project. Google, in conjunction with the Moscow Department of Culture, has unveiled a project called Literary Moscow, featuring digitized versions of the Russian capital’s nine leading literary museums. These include the State Literary Museum and museums dedicated to Alexander Pushkin, Vladimir Mayakovsky, Nikolai Gogol, Mikhail Bulgakov, Sergei Yesenin, Konstantin Paustovsky, and Alexander Ostrovsky. 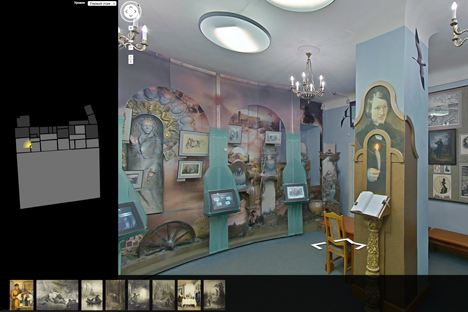 Google is offering virtual panoramic excursions and digital exhibits illustrating the lives and work of these Russian authors and poets. The project was presented at the First Moscow International Forum “Culture – Look into the Future.” Participants included Director of the Moscow Department of Culture Sergei Kapkov, General Director of Google Russia Julia Solovieva, Program Manager at the Google Cultural Institute in Europe and Brazil Luisella Mazza, and the directors of the Moscow museums. Each museum has created its own virtual tour. The Pushkin museum has opened a virtual exhibit called “Portraits of Pushkin,” which features rare portraits of the famous poet. The Gogol museum has put together an exhibit called “Gogol in Book Illustrations,” and the Bulgakov museum is making a virtual tour of the famous “bad little flat” – a real room in a Moscow building near Patriarch’s Ponds that served as the prototype for the abode of the “evil forces” in Bulgakov’s novel “The Master and Margarita.” Virtual tours of the museums are available using Google Street View. So far the information is mainly available in Russian, but in the future the project may be adapted for foreign users. Virtual users have the unique opportunity to study manuscripts, drawings, portraits and other exhibits in great detail, which is not always possible at a real museum. Based on stories published in Russian at RG and Blogspot.ru.